I know, I haven’t updated in forever. Trust me, it is NOT because I haven’t been eating. What an outrageous thought. Nope, rather my absence can be attributed to the fact that I haven’t had access to a real computer since my last Santorini post. As a result, I haven’t been able to upload the (hopefully) b-e-a-utiful photos that I’ve been taking of every meal and snack (to Gord’s occasional embarrassment and disapproval). I’ve decided, however, to write a few posts anyways, otherwise things will never get done. Until I can upload my actual pictures to a computer, you will just have to deal with my semi-okay iPhone photos. I shall replace them with the real thing shortly (maybe tomorrow in Copenhagen). Positive: perhaps the mediocre quality of the photos will make you less tempted to drool! On our first full day in Rome, Gord and I separated for the afternoon to do some independent sight-seeing. Clearly, the phrase independent sight-seeing did, and always will, translate to mean that I had the opportunity to find more food. So what if I had just eaten lunch? It’s not everyday a girl’s in Italy. After making a hastily thought up wish at the Trevi Fountain whilst trying my best not to be pick pocketed, I started off in search of what I thought was one of my many Twitter food recommendations. My endpoint was a mysterious location that I had, for some reason, saved in my iPhone’s Google Maps the day before. 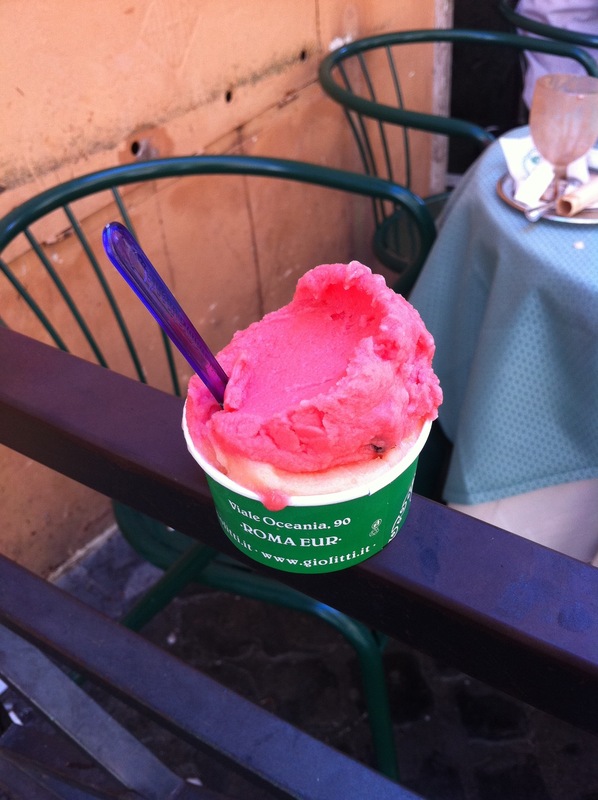 After sadly discovering my map destination to be an empty alleyway, I decided to console my lost self with strawberry and lemon gelato across from the Trevi Fountain, before starting the long walk back to meet Gord at the place where we were staying. Now at this point I really did have every intention of returning back in order to make our pre-arranged 5:15 meeting time. 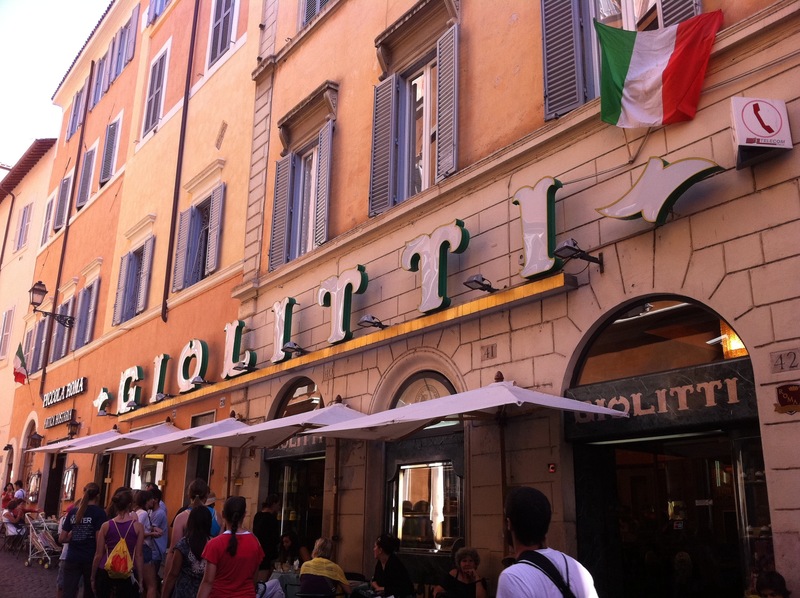 But then I saw it: the sign for Giolitti gelato, the specialty shop my friend Elisa had recommended to me. Well that was that, meeting time or not, I had to get more gelato. 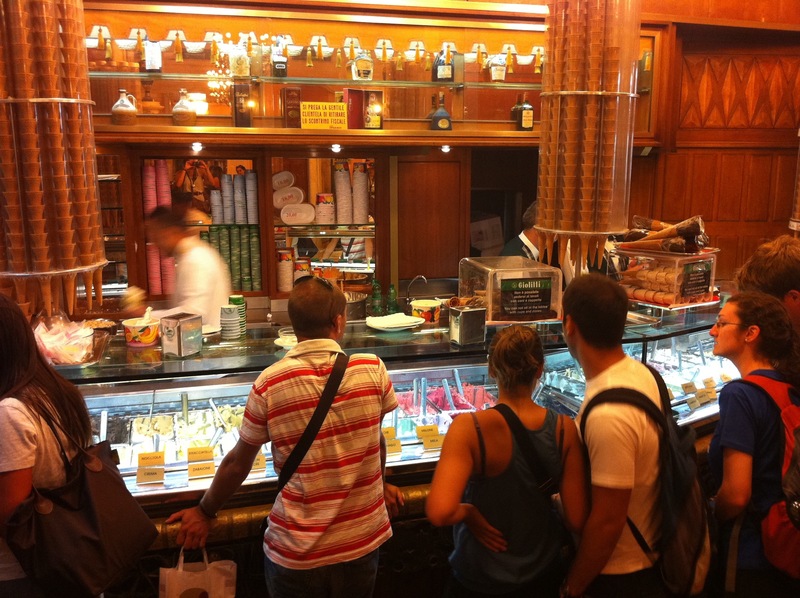 Nestled beside the Italian parliament buildings on Via degli Uffici del Vicario, Giolitti is to Italian gelato as Laduree is to French macarons. I found the shop just as I was finishing up my first gelato cone. Slightly embarrassing? Perhaps. Judge not, dessert lovers. Despite the shop being packed, I went forth anyways, for good gelato is always worth the wait. 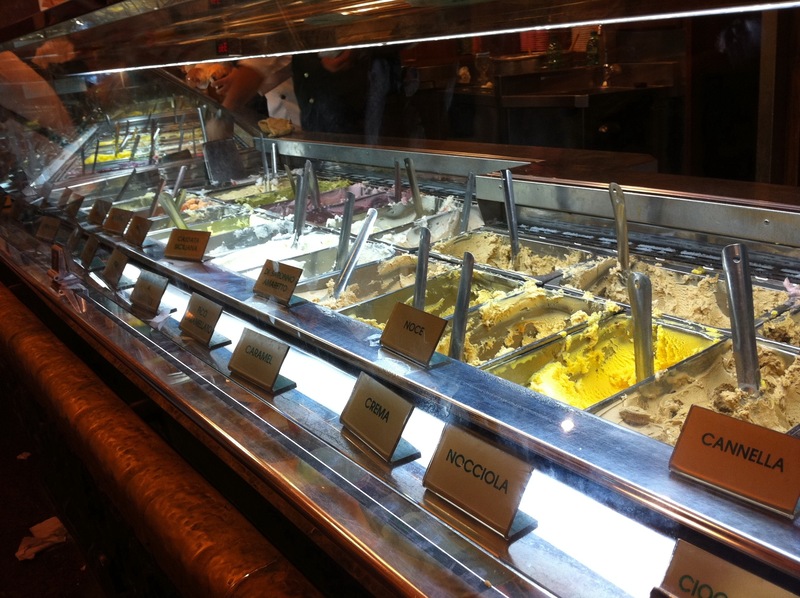 Pushing my way up to the glass display case, my eyes went wide with the sight of more than 30 different types of gelati. Put on the spot, I settled on a small cup of orange and, what I thought was raspberry, but actually turned out to be watermelon (in hindsight, it was a beautiful mistake). The orange gelato had real zest in it and, combined with the tiny chocolate “seeds” of the watermelon, I felt like I was eating a luxurious Terry’s chocolate orange. The watermelon was also perfectly refreshing. Thanks to my little gelato delay as well as a complicated route back that saw me accidentally find the Colosseum, I finally got back to the bed and breakfast at 6 p.m., 45 minutes after our original meeting time. All in the name of gelato. 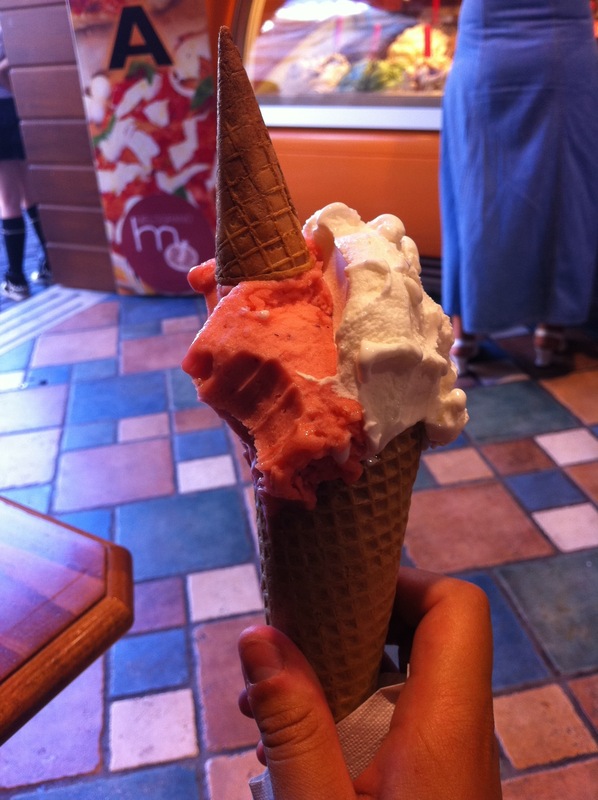 PS: here’s a final list of the gelato flavours I tried while in Rome and Florence: lemon (x2), strawberry, orange, watermelon, mascarpone cheese (my favourite!) and a generous spoonful of Gord’s creme caramel.